If you watched any Irish rallying on TV in the 1990s and 2000s, then you were likely tuned into UTV or RTE for the latest episode of RPM, the commentary unmistakable as the brogue of Alan Tyndall, or as he’s known to most as, Plum. 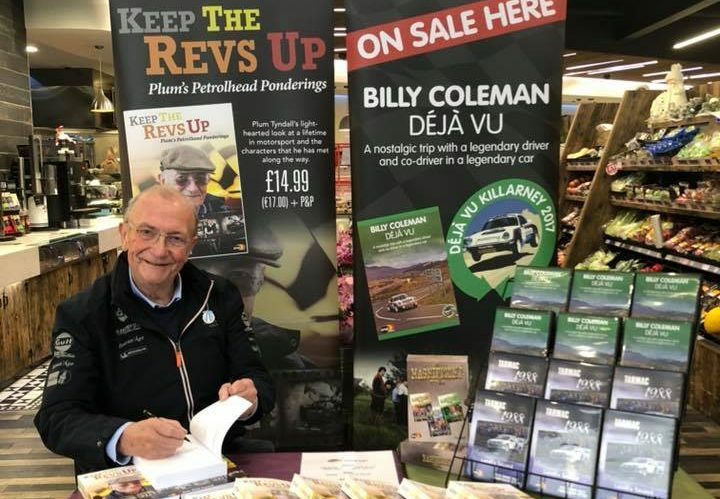 Known throughout Ireland and beyond as a broadcaster and motorsports commentator, Plum has released an autobiography in Keep the Revs Up – Plum’s Petrolhead Ponderings. 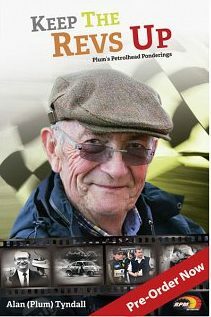 Now in his seventies, Plum has taken stock of decades of his life and obsessive levels of enthusiasm for cars, motorsport and media. On lifting the book and scanning the blurb there’s this bullet list of ‘Did you Knows’. That he sold cushions at Wimbledon or competed in the Irish Saloon Cars. This does Plum’s story disservice. In a shade over 500 pages you’ll read of a self-conscious Bishop’s son who bonded with others over his love of cars, struggled with his early career and life direction, dealt with divorce and beat oesophageal cancer. It’s also the story of an entrepreneur who made his passion his job, and yes as the blurb did promise, he ‘mingled with the motoring mighty’. Keep the Revs Up starts in the early days of Plum’s Sligo childhood but each chapter begins with a section on Plum’s cancer diagnosis in the late ’90s. This format jars at first but as you immerse yourself in the dual time periods things start to make sense. No doubt the intention here is for one to give context to the other. That may sound fairly hard going, but its quite the opposite. Most of his Ponderings are hilarious anecdotes of when life goes sideways, or Vauxhall Firenzas end up on their roof on the Hillhall Road outside Lisburn. Or you forget the rings as best man and the ensuing mad dash. All told with a knowing wink and style that runs from light hearted to satirical. Expect to snort a chortle or three! I enjoyed the book that much I took advantage of having direct access to the man himself and we met up in Hillsborough Co. Down last week to talk about his varied and no doubt very successful career and life. I’ve touched on a very few of the several parts of Plum’s life. He had lived and worked Belfast, Dublin, London across a variety of PR roles, before setting up on his own in the early ’80s back in Northern Ireland. We talked about the risk of ‘going alone’ especially in the backdrop of troubled Northern Ireland. His early career is only half (or less) of the picture, and Plum seemed to wrangle himself into every Irish motorsport event going. Be that competing in the Irish Saloon Car championships to copious trips to the US, continental Europe and further afield for the greatest motoring events in the world. Back to the book, on several occasions Plum goes into detail about how he orchestrated the logistics of rally coverage on a tight budget including a print room in the back of a lorry with a team collating and running off rally dailies! He also seems to have great taste in cars, but seemed to end up with some of the most questionable examples or just sheer bad luck. Whether it was a Frogeye Sprite (the ‘Tart Trap’ – what a nickname) that spun it’s bearings as soon as look at it, or his Mitsubishi Evo 5 that was sadly pinched in Lisburn one day, there was always a story worth telling. In fact Plum reckons he filmed parts of said Lancer on RPM as no doubt it was stripped and parts sold to the rally community! Plum covers a lot of ground in this book, and while most of the stories land well, the jumping timeline does take a while to compute, as does the use of bold and unfortunately some typos and extra line breaks that sneaked past the editor. My technical qualms aside the stories, photos and asides on the many vehicles mentioned are a superb addition, so all else is easily forgiven. Keep the Revs Up is on sale now on the RPM Website.